Of course this is only a part of this rotten capitalist society, but we萸�l fight against it and we萸�l find ways to avoid situations like our present in the future. Like in many other issues the new Roh administration promised before the election last December especially to protect the poorest of the society and the ordinary workers from the arbitrariness of the capitalist class. Like in many other cases ?nothing has changed. Also Roh promised a stronger struggle against corruption. Of course also in this issue: nothing changed, as we�ve to learn these days. Yesterday, Tuesday July 29th, I went to Seoul Shichong (city hall) to check out about the planned rally against water privatization. I�d to find out that only four people joined the protest (a comrade from Da-hamkke/All together same day to me: �A very important rally.?. Not really happy I left the place, wanted to walk to my office. On the way I�d to pass downtown�s Jongmyo-gongwon (park). There I saw two cars, full with banners, flags and placards, entering the area of the park. And I decided to follow them to see what will goes on. Some people begun to decorate the area with a lot of banners and it seemed for me that there will be held a more traditional rally. After a while more and more, mainly ordinary people, like elderly women and mans, but also Younger people arrived - all in red t-shirts, many with red front bounds. More and more I got interested, what will be happen here. After a while people here made a contact with one English-speaking young woman for me. She told me the background story about this color full rally. �This people you see here are all ordinary persons invested mainly all their money in a planned shopping mall near Dongdaemun, downtown Seoul, to get later a little shop in it. ?Kim Hyeon-ju continued, �But the client used the money for other business and lost all the money on this way. So most of the investors here lost around 35 billion Won ?everything what they had before. ?Of course several business of Yoon Chang-yeol, the client, were illegal, so he paid bribes to politicians ?among others to Jeong Dae-cheol a member of the National Assembly, the South Korean Parliament, and of Roh�s Democratic Party. Possibly Jeong got from Yoon around 3 billion Won as bribe ?of course a part of the 35 billion Won Yoon got from the investors. So the rally changed from colorful to really angry, but powerful. The masses demanded the repayment and consequences for the Roh administration. 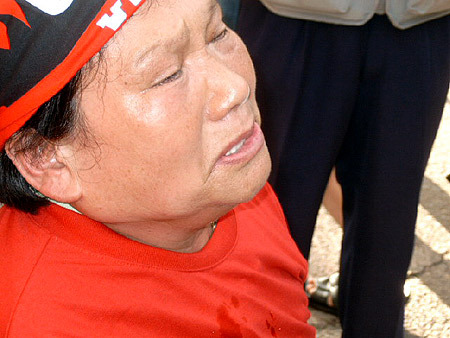 Kwon Yong-gil, the leader of Minju-nodong dang (Democratic Labor Party) accused the ruling party to continue on the same way of corruption like all the administrations before. Also demanded strongest to take consequences for the Roh administration. One elderly woman entered the stage and accused, bursting into tears, Yoon to robber all what she had before ?she lost millions of won. 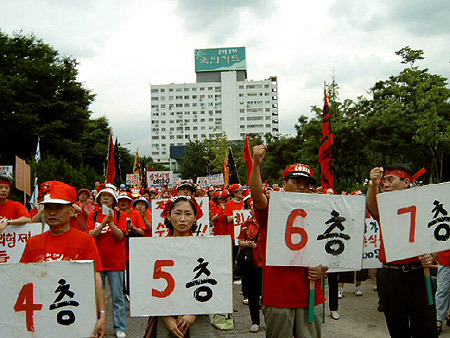 After the rally it was planned to march to Dongdaemun area where, the shopping mall were planned to be build. But on the entrance to Jongmyo large units of riot cops blocked the way. 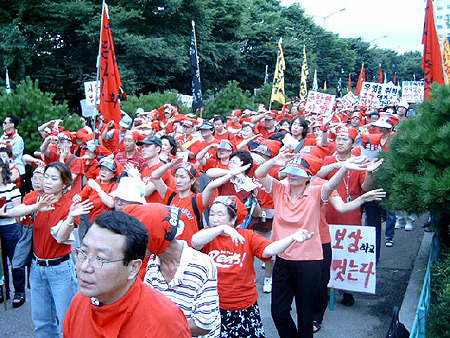 After some fights with them the demonstrators left the scene, searched and found ways to took Jung-no avenue, one of Seoul�s largest roads, and marched to the direction of Dongdaemun. There a further powerful rally was held. A while later again the cops entered the scene. 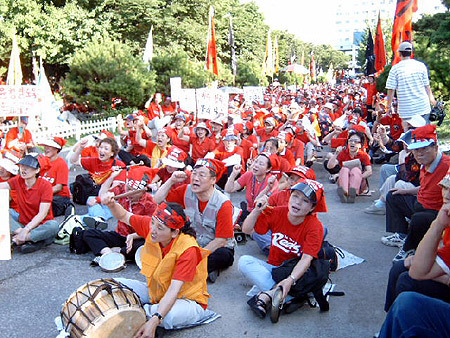 Around half hour later the protestors finished the rally, �only to meet each other again �in front of Cheong Dae-cheols apartment house. Hundreds of very angry people gathered in front of the building and many entered the flour where his flat is located. They shouted slogans, ringed his bell and knocked on his door. After a while the cops also arrived and cleared the area, partly very violent. But the protestors promised to come back, until they will get back their money and justice. 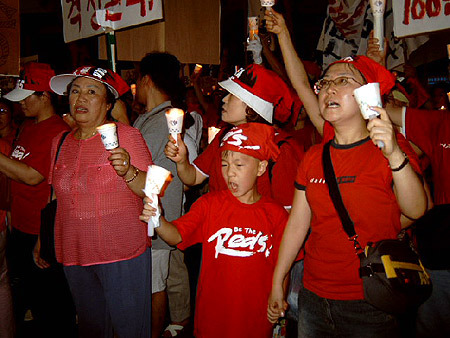 Kim Hyeon-ju on the end of this evening: �Of course this is only a part of this rotten capitalist society, but we�ll fight against it and we�ll find ways to avoid situations like our present in the future. But this is another story, I�ll tell later. ?